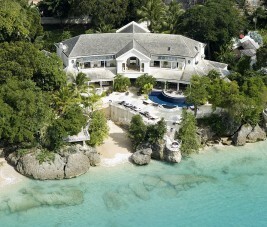 Cove Spring House is located on Barbados. It is twenty minutes from the airport with direct international flights to Miami, New York, London, Manchester, Toronto, Philadelphia, Montreal. 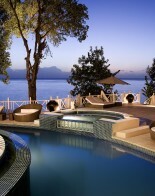 Cove Spring House is the most luxurious and desirable private home located on the sought after Platinum Coast on the island of Barbados in the Caribbean. It offers a unique location, stunning interiors, secure walled gardens and is the perfect getaway for the traveler seeking the ultimate in luxury. Cove Spring House is extremely popular among the rich and famous with guests including Oscar winners, supermodels, and Forbes lists financiers. Cove Spring House isn’t just located on a beach – it has it’s very own private beach! There is a natural coral stone cliff where the house sits which encloses a safe and sandy beach which is protected by an outer reef. Inside this luxury vacation home are ten superbly appointed guest rooms. All are air-conditioned and have expensive Ralph Lauren furnishings decorating them. The house can accommodate a group of up to 20 people. There is also an indoor cinema with 20 reclining viewing chairs, a library, and a fully equipped gym. Cove Spring House has an abundant amount of private verandahs which are furnished with comfortable lounge chairs and sofas so there are many private places for people to relax. Outside the house, there is a half moon fresh water swimming pool with a spa which is surrounded by tropical gardens and Balinese lounge chairs. Near the pool there is also an outdoor garden gazebo with a chef station – perfect for al fresco lunches and relaxing outdoors. Cove Spring House has the space, the expertise and the staff to give guests a five star service. Whether it is an intimate dinner for two, or a lavish party for 20 people, the staff of 16 are there to cater for your every need. Please note for Christmas and New Years period rates please contact us. Holidays subject to 10% premium: Presidents Day, Independence Day, Easter, Thanksgiving. All rates are exclusive of 7.5% value added tax and 10% service charge. Championship golf, tennis, horse back riding, spas, snorkelling, scuba diving, wind-surfing, water skiing, deep-sea fishing, sailing, visits to colonial sugar plantations, museums, prehistoric caves, exclusive bars and clubs, drive in cinema, massages, Wifi facilities.